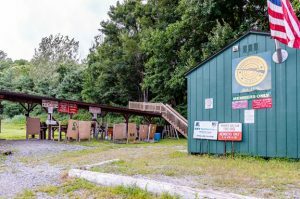 PROSPECT — The Prospect Gun Club and residents of a neighborhood near the shooting range are working to find a common ground over noise and the club’s shooting hours. Prospect Gun Club President Jerry Williams told the Planning and Zoning Commission at its Nov. 7 meeting that he reached out to Don Reilly, who lives on Tress Road and has been critical of extended hours at the shooting range, to discuss possible ideas to alleviate the issue of noise from the range. Williams said the club is willing to roll back the time the range closes an hour to 6 p.m. and limit shooting to .22 caliber guns on Tuesdays and Wednesdays during the summer months. This summer, the Planning and Zoning Commission approved extending the hours and days club members can shoot at the range, which is located on town property behind the public works garage at 211 Cheshire Road. The extension was the second one granted by the commission over the past couple of years after the club, which used to only be allowed to shoot on the weekends, took measures to mitigate noise coming from the range. The commission agreed to extend the summer seasonal hours at the range to 4 to 7 p.m. on Tuesdays, Wednesday, Thursdays and Fridays. The extended hours also gave the club an extra hour on Saturdays from 9 a.m. to 7 p.m. and allowed shooting on Memorial Day and Labor Day from 9 a.m. to 12 p.m. In the winter months, the only change was an additional three hours on Sundays from 9 a.m. to 3 p.m. There is no shooting on weekdays, with the exception of the Friday after Thanksgiving, and the Saturday hours are 9 a.m. to 4 p.m., which didn’t change. The winter seasonal hours start and end with daylight saving time. The commission’s decision to grant a second extension upset neighbors who live near the range, particularly residents of the Tress Road area. Residents, gun club members and the commission have been going back and forth over the issue for the past several months. Williams said club members are OK with the proposal he presented to the commission, and he’s hoping the neighbors agree as well. In a phone interview, Reilly said the two sides are very close. He said he’s satisfied with the proposal Williams laid out to the commission. However, he said, there remains one sticking point — the three extra hours on Sundays during the winter. Reilly said he can’t speak for the whole neighborhood, but the consensus is that residents are still against the extended Sunday hours from 12 to 3 p.m. during the winter season. “We’re basically three hours apart,” said Reilly, who added he feels the issue is moving in the right direction and plans to continue the discussion with Williams. During the Nov. 14 meeting, Alice Magnarella, who lives on Tress Road, said she appreciates the communication between the two sides and the effort, but added that the extra Sunday hours remain a point of contention for the neighborhood. Last month, the commission recommended the club look into further options to reduce noise, including building a sound barrier wall. In a phone interview, commission Chair E. Gil Graveline said the commission was trying to come up with a concrete suggestion to help the situation. If the neighbors and club members can reach an agreement through discussions, he felt that would satisfy the commission.